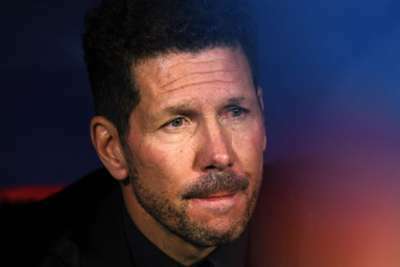 Diego Simeone and Diego Godin praised Atletico Madrid's character after they overcame a second-half scare to beat Real Valladolid 3-2. Antoine Griezmann dispatched a penalty on the stroke of half-time having created Nikola Kalinic's 26th-minute opener at Estadio Jose Zorrilla. The hosts responded impressively and Saul Niguez's own goal after Fernando Calero's header brought them level after the hour, only for the brilliant Griezmann to settle matters on his 300th LaLiga appearance. "I'm very happy about the win. We needed to win away from home," Simeone told reporters after watching his team move level on points with LaLiga leaders Barcelona. "Valladolid are a tough opponent. They play well at home, they're doing a very good job in LaLiga. "They scored two set piece goals, but our team reacted and we won a very tough and difficult game that we needed to win. "We showed strength to win a match that any other team would have lost." Atleti captain Godin was left in the unusual position of marshalling a defence that mislaid its customary solidity. "The team reacted very well to the equaliser," the Uruguay international told reporters. "We rebelled and found the third goal to get the win. It's always important to win away from home. It was an important match." Simeone reserved praise for Griezmann's star turn, which underlined his status as one of the finest players in the world. "I have no doubt, he knows the place he has in football," the Atletico boss added. "He has won it with his play and he has been the determining factor." Atletico will assess Filipe Luis over the next 48 hours after confirming the left-back suffered a thigh injury, which forced him to be substituted in the 60th minute.